Peter Simon Pallas was born in Berlin on September 22, 1741. He was the son of Simon Pallas, a Professor of Surgery. He studied with private tutors and took an interest in natural history, later attending the University of Halle and the University of Göttingen. In 1760, he moved to the University of Leiden and received his doctor's degree at the age of 19. Pallas became one of the universally distinguished naturalists of his time. While employed as a professor for natural history in Berlin, he traveled to St. Petersburg in 1767 at the personal request of Empress Catherine II (Catherine the Great). Here he was appointed Assistant of the Russian Academy of Sciences and was commissioned with a five-year exploration (1768-1773) through the central Russian provinces. His reports from this expedition were published in three volumes under the title Reise durch verschiedene Provinzen Des Rußischen Reichs (Travels through various Provinces of the Russian Empire). The reports covered a wide range of topics, including geology and mineralogy, reports on the native peoples and their religions, and descriptions of new plants and animals. 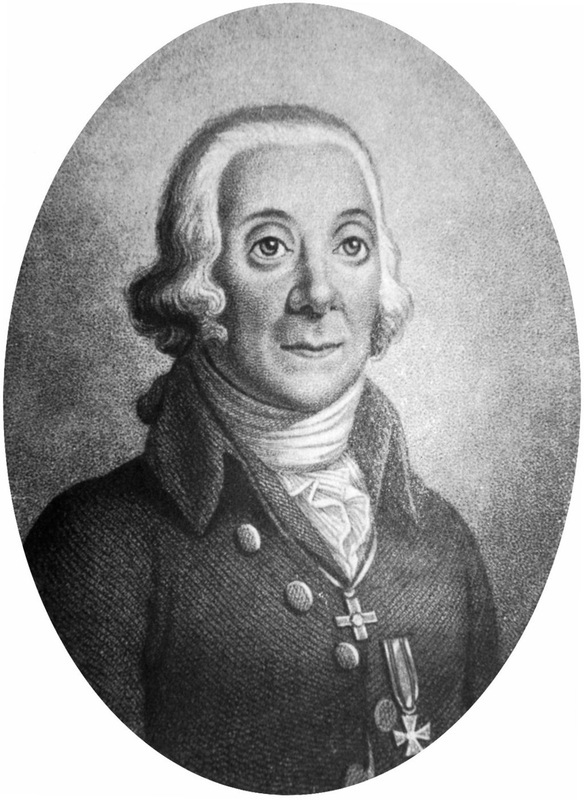 Pallas counted a total of 6,194 German colonist families with 25,781 people (13,441 males and 12,340 females) on his journey through the Volga colonies in 1773. The number of families was less than in 1769, but the population as a whole had grown considerably despite low life expectancy. Pleased with the work that Pallas had accomplished, Catherine II rewarded him for his services with a property in the Crimea, to which Pallas retired in 1796. Shortly before his death, he returned to Berlin and died there on September 8, 1811. 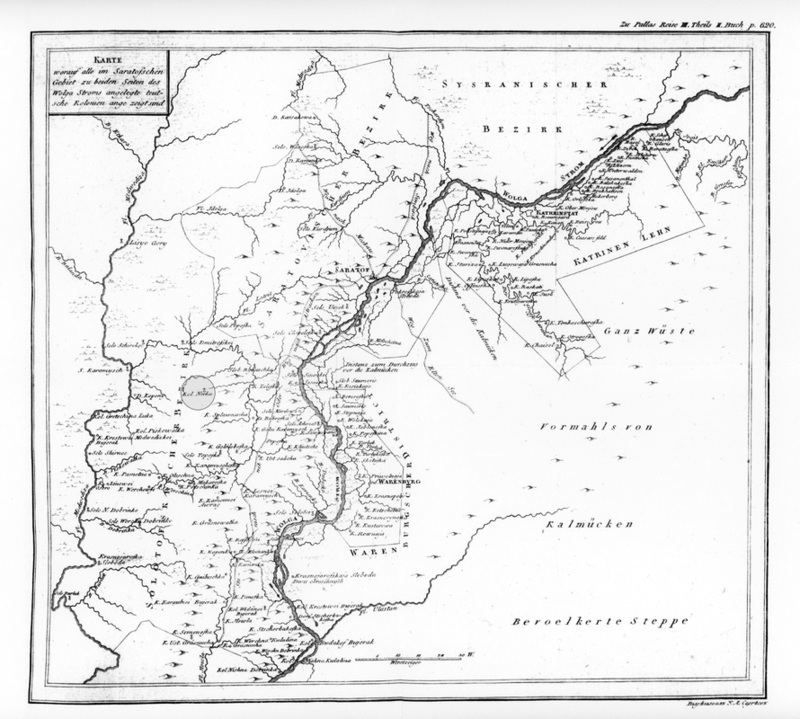 1773 map of the Volga German colonies from the expedition of Peter Simon Pallas, a German botanist and zoologist. From the book titled "Reise durch vershiedene Provinzen des Russichen Reichs; 3 Theil, 2 Buch." The colony of Norka is circled and shaded in gray. Pallas, Peter Simon. Reise Aus Sibirien Zurück an Die Wolga Im 1773sten Jahr. Des Dritten Thiels, Zwentes Buch. St. Petersburg: Kaiserl. Academie der Wissenschaften, 1776. 622-25. Print. Pallas, Peter Simon. Reise Durch Verschiedene Provinzen Des Rußischen Reichs, Dritter Theil, in denen Jahren 1772-1773. Frankfurt und Leipzig: Johann Georg Fleischer, 1778. Print.